Papers: 1921-1993 (bulk 1940-1980), 91 cubic feet. The collection contains correspondence, clippings, speeches, articles, campaign literature, legislative bills and resolutions, printed materials, photographs, oral history transcripts, and memorabilia, chiefly relating to his congressional career, political campaigns, and foreign policy. A finding aid is available online. Oral History: 1970, 149 pages. Papers: In the files on the Pew Memorial Foundation, 1948-1957, 3.5 linear feet. Persons represented include Walter H. Judd. Oral History: 1976, 123 pages. Former Members of Congress Oral History Project. Papers: 1926-1984, ca. 105 feet. Collection contains correspondence, speeches and writings, printed matter, and audio-visual material relating to U.S. domestic politics and foreign policy, the Chinese civil war, U.S. and United Nations recognition of China, and aid to Chinese refugees. Papers: In the records of Aid Refugee Chinese Intellectuals, 1952-1970, 44 boxes, 6 envelopes. Correspondents include Walter Henry Judd. Papers: In the papers of Loyd Wright, 1924-1971, 45 boxes, 1 envelope. Oral History: In the United States Capitol Historical Society oral history collection, 1976-1991, 13 items. Collection contains typewritten transcript of oral history interview with Walter H. Judd. Papers: In the Henry Robinson Luce papers, 1917-1967, 45 linear feet. The collection contains copies of transcription letters written by Judd while he was a medical missionary in China. Oral History: In the John Foster Dulles oral history collection, 1965, 131 pages. Oral history discusses China in the 1920s and 1930s and during World War II; Alger Hiss; Communist subversion and McCarthyism; JFDs relations with the House; his appointment as Secretary of State; his views of the British; his travels; Far Eastern policy; the Japanese Peace Treaty; the Philippines; JFDs relations with the President; his relations with State Department personnel; Viet Nam and Laos; SEATO; JFDs illness; the Aswan Dam and Suez; relations with the British and French; brinkmanship; Quemoy-Matsu; Korea. Sound recording: In the Arthur W. Kramer sound recording collection, 1958-1965, 2 linear feet. 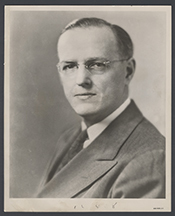 Collection includes recording of speech entitled Effective Foreign Policy given by Walter H. Judd. Papers: In the papers of Blair Moody, 1934-1952, 31 linear feet. Collection includes sound recordings and visual materials of Walter H. Judd. Papers: In the Robert S. Pace Collection, 1669-1993, 200 items.